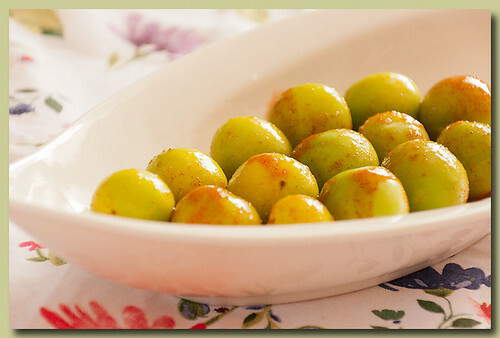 Salted green plums, swimming in Tapatio sauce with a little salt, add it to your tapas list. That's all there is to it, green plums, Tapatio and salt. I just wanted to share this with you real quick. I gave myself a little break, and visited my friend Squeaks last weekend. We hit up the Irvine Farmer's Market and I discovered them there. Wait 'till you see the killer knife I bought while I was up there. I'm still buried in school work, and my final project is due next week. See ya soon.